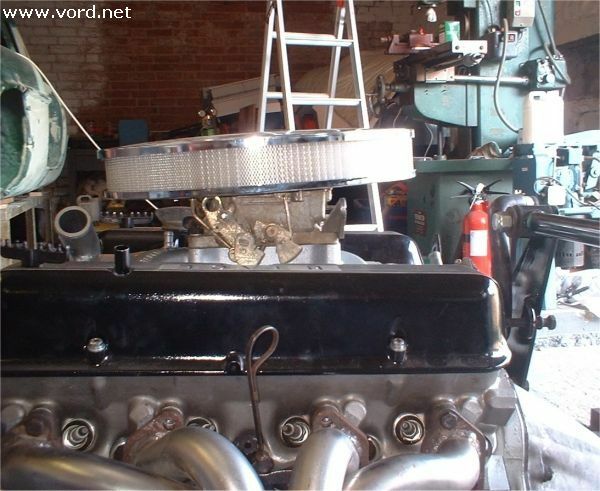 My engine is fitted with an Edlebrock Performer inlet manifold which is relatively tall. I don't want to make any external changes to my MGB (other than the twin exhaust pipes) and so needed to find a way to avoid a bonnet bulge. I could have used the lower Offenhauser manifold, but this is less good for performance. My solution was to lower the engine. This also has the advantage of slightly lowering the centre of gravity and hence improving road holding. My first step was to angle the air filter to the carburtettor by machining the air filter to a slight angle. This made the angle of the air filter the same as the slope of the bonnet and reduced the height of the front of the air filter by about 15mm. The K&N filter is about 6mm taller than the filter pictured and I am hopeful that I will have enough room to fit it. 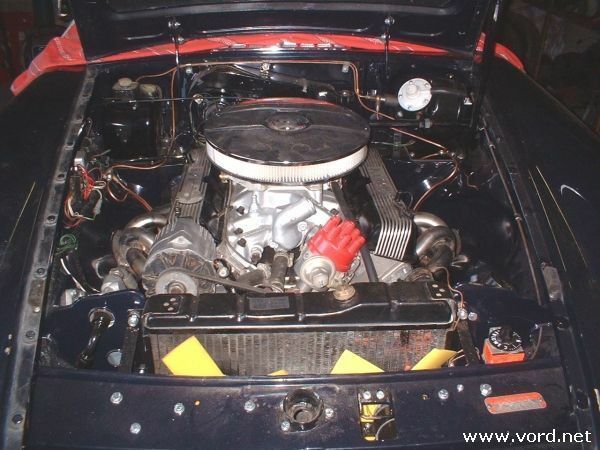 My car was fitted with original MGB V8 engine mountings. I moved the mounting holes downwards by 8.5mm to raise the engine mounting on the engine. I had to weld some new metal into the lower part of the mount as the new hole was on the edge of the existing metalwork. 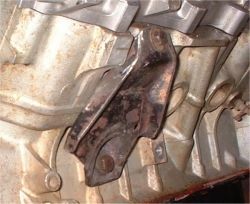 The original mounts have a reinforcing flange outboard of the top bolting face which is close to the chassis. I cut this flange off and welded a new flange in the inside face of the mount to increase clearance. 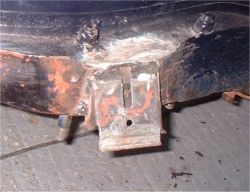 The photograph also shows the position of an ancillary mounting boss immediately forward of the top bolt hole which I removed to increase clearance to the suspension crossmember mounting bolt. I relocated the engine mountings on the chassis downwards by about 10mm. I had to cut a new hole for the steering column and weld in some metal where the hole had previously been. I ended up fitting the RHS engine mount (pictured) a little low. I would recommend welding the mounts in so that the angled face of the mount continues to no more than 5mm below the edge of the chassis after the spot weld flange has been removed from the chassis. The flexible pipes from the oil pump to the filter and cooler fouled the corner of the chassis with the engine in it's lowered position. I cut a large corner off the chassis to increase clearance and welded in a plate to retain the chassis strength. 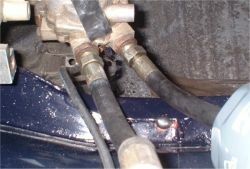 The oil pump on the LHS of the engine and the timing cover on the RHS of the engine were both very close to the steering rack when the engine was lowered. 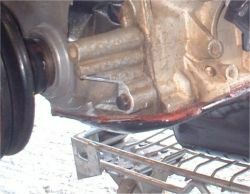 I removed part of the timing cover and tilted the engine down on this side to increase clearance for the oil pump. 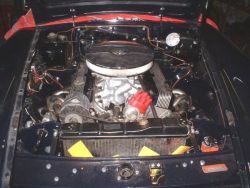 The engine bay nearly finished showing the position of the lowered engine. The top of the rocker covers at the front of the engine is now about 70mm lower than the top of the flange where the wings are bolted on (50mm is standard). Vertical clearance between the oil pump and steering rack is only 16mm so I will need to keep an eye on the engine height and shim the engine when the mounts settle.